FANCY LED TRUCK Changes The Lights With The Music! When we have the chance to look at things we like a lot, we often think that they are too good to be true! Sadly, that statement sometimes turns out to be true, but it leaves the hope that someday we`ll finally have the opportunity to witness what we long for. And with the technological progress our chances go up! An inevitable part of the technological progress are the graphic designers who virtually create everything that surrounds us. The following video is actually created by a graphic designer who pretty much does this for fun! His name is Igor Sandimirov and he is the creator of this LED truck. As a matter of fact, the video below is fun! It is actually a dimmed picture of a huge yellow truck with a bunch visual effects. 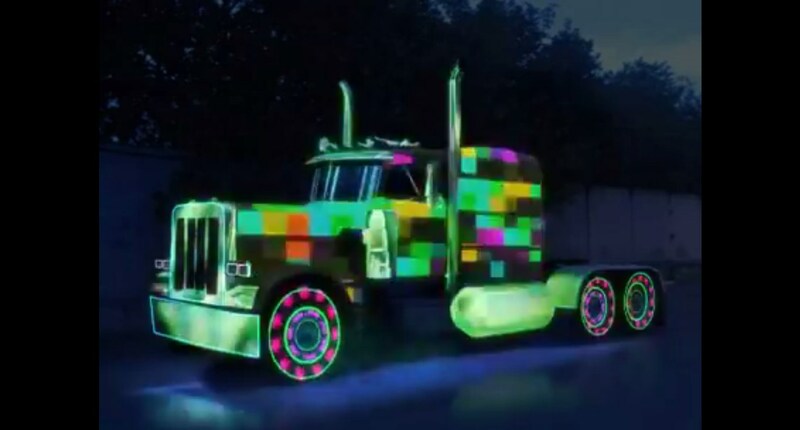 These effects make the LED truck look like it has millions of tiny LED bulbs that change their color and pattern in accordance with the music that runs in the background! This is the kind of an object that seems too good to be true, just to make clearer what we said earlier. Anyway, it all starts at the grille and after a few seconds the whole truck is awash in color! Finally, follow this link to watch one extreme custom GMC Sierra pickup truck that also has an impressive lighting technology!